grandma's cookie jar: It Is Bake for Family Fun Month - Let's Bake Some Cookies! It Is Bake for Family Fun Month - Let's Bake Some Cookies! Yes, February is, "Bake for Family Fun Month" . . . and since it is typically a chilly month, it tends to be a wonderful time to "fire up" the oven and bake some, "family fun"! Around this grandma's house, there are few things more "fun" than baking a batch of homemade cookies! So, today I'm happy to share with you one of my grandsons' favorite cookies . . .
11. Sprinkles – as many as you like! 1. Beat butter, peanut butter, and sugars together. 2. Add eggs and vanilla and mix for a couple minutes until well combined. 3. Add flour, salt, soda and mix. 4. 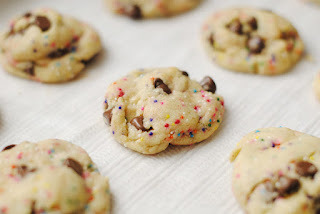 Add chocolate chips and sprinkles and mix. 5. Drop onto baking sheet and bake in a preheated 350 degree oven for seven to eight minutes – until golden around edges, but still soft. 6. Place on rack to cool. These cookies are fun to make . . . my grandsons love to “sample” the dough – and fun to eat for sure! I always send cookies home with my grandsons to enjoy with their parents . . . they all approve of this! Yes, when it comes to family fun and baking, cookies fit the bill for sure! What are your favorite family cookies?